Derrick Wilson pretty much knows how teams are going to play him on a given night. The 6-foot-1 junior has made one 3-pointer in 12 attempts this year, gets to the free throw line just 2.5 times per game and, despite a quick first step, hasn’t shown a consistent move to reach the basket in half-court sets. His numbers across the board aren’t poor; 4.1 assists to just 1.6 turnovers, 3.8 rebounds and 1.2 steals per game in a team-high 30 minutes are nothing to scoff at, but as a scorer he’s as limited a starting point guard as you’ll find in the country. He’s had his days — four games in double figures — but his three highest scoring outputs of the year have come in losses. 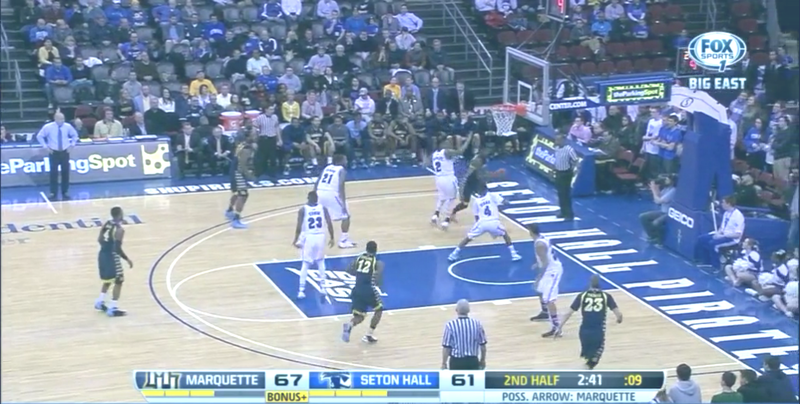 Simply put, Marquette is at its best when Wilson looks to pass, not score. But what about when Wilson looks indirectly to beat defenses at their own game? That’s what happened Tuesday night at Seton Hall. Pirates guard Sterling Gibbs spent all evening guarding Wilson from the painted area, essentially daring Wilson to shoot from the outside or, more accurately, letting Wilson know he was aware of his two 3-pointers in 1,458 minutes at Marquette. So Wilson spent much of the evening facilitating after attempting the first shot of the game (a miss), finishing the contest with five assists in 27 minutes. His biggest moment of the game occurred with less than 3 minutes to go. 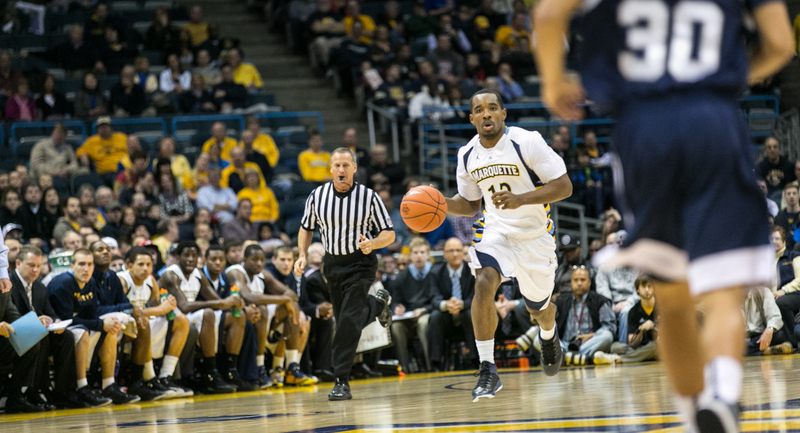 Marquette led by six, 67-61, facing full-court pressure from the Pirates. Wilson broke the press and initiated the offensive set with a pass to Gardner on the left wing. Gibbs, again, was playing Wilson at 15 feet. Gardner found Jamil Wilson on that same left side, and by then Gibbs had moved all the way into the paint, just in front of the restricted area (below). It’s almost laughable looking at the play. Jamil Wilson has the ball on that left wing, looking to play a two-man game with Gardner. Gibbs is paying absolutely no attention to Derrick Wilson, playing help defense on Marquette’s two biggest scoring threats on the floor. As Jamil Wilson drives left, Gibbs comes over and gives help, turning his back to Derrick Wilson (below). 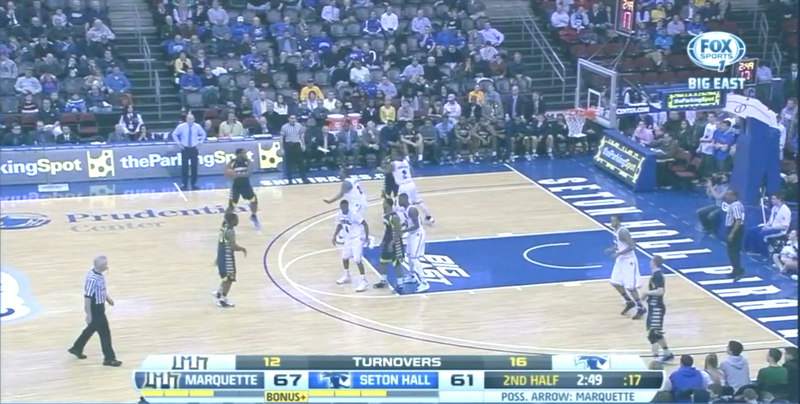 At the exact time Jamil Wilson drove the left baseline, Derrick Wilson cut to the basket. He was an All-State high school running back, so finding holes in defenses has always been his forte, and he did it here phenomenally (below). There are a few things to break down here. First, the play doesn’t happen unless Jamil Wilson has his head up. He’s been a great passing big this year, and this is pretty much perfect execution. Also, help defenders guarding Todd Mayo and Jake Thomas were less likely to help out because of the 3-point threats. In this sense it was solid spacing and personnel use by Buzz Williams. Wilson finished the play with a layup after Fuquan Edwin (No. 23) initially tipped the ball, and it gave Marquette an eight-point lead they eventually pushed to 11 in a 77-66 victory. 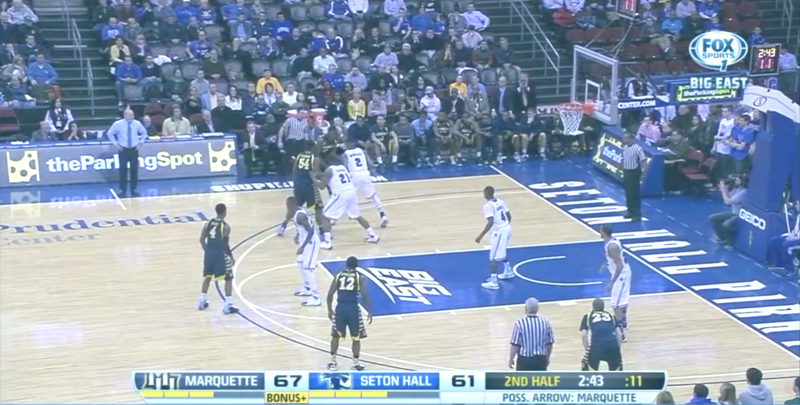 So this is where Marquette stands. 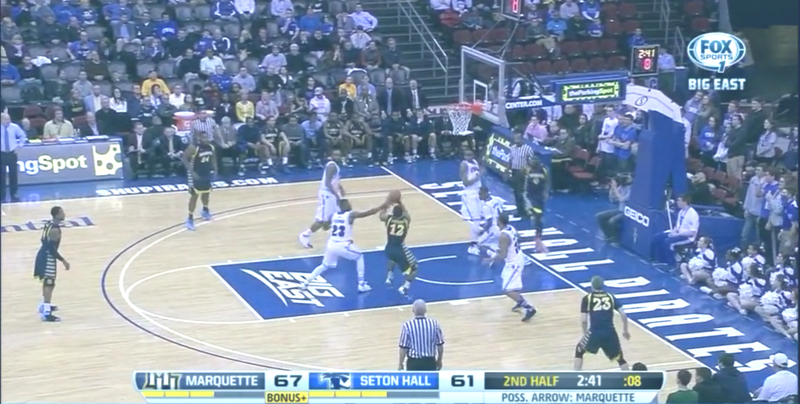 No team is going to play Derrick Wilson off-the-ball as much as Seton Hall did — it was a sound tactic by the Pirates, but they didn’t execute it well — but there’s no question Wilson is going to see plenty of open space in the halfcourt. There are two possibilities for Wilson. The first is being able to sneak past cheating defenses, which only works if the players around him are able to shift defenses and make the help defender (Wilson’s defender) play actual defense. Wilson’s a smart player, and finding those holes will be important if he’s going to contribute. The second is his passing. Seton Hall is a below-average defensive team that doesn’t turn teams over as much as other Big East teams. Still, if Wilson is going to see these types of defenses it’s going to mean more freedom to see the rest of the court and make sound passes. It’s not a coincidence that Wilson tallied five assists and didn’t turn the ball over once. Wilson is going to have to make this work, even if it’s less decorated than what Seton Hall did.